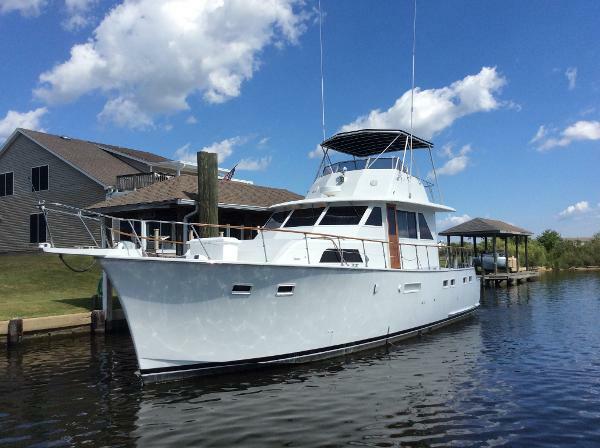 1968 Hatteras 50 Yacht Fisherman PRICE REDUCTION! Bella Donna is a rare and much sought after Hatteras Sport Fish. The Sport Fish combines the luxury of a motor yacht and functionality of a sport fisherman into one, with comfort in mind. Powered by twin natural Detroit 871s, she has the power to perform and ability to cruise very efficiently at 10 knots. Being 48 long with a beam of 15 4 she has a spacious interior and covered side deck, with plenty of forward deck space. Engines were overhauled by Detroit trained mechanics in 2003 & rewired and re-plumbed during the same period. In January 2017, the starboard engine was removed & replaced with a completely rebuilt engine. The port engine has less than 800 hours, since major overhaul & the starboard engine has less than 10 hours since major overhaul. Oil change, fuel filters, and impellers were serviced in September of 2016. Hauled out in May 2015 for inspection, bottom job and replacement of anodes. She has dripless shaft logs and an oil change system. The owner takes pride in this vessel and is shows. Service records available upon request. The current owner has enjoyed owning her since 2003 and wants to down size to better accommodate his current life style. For the buyer looking for an efficient and comfortable cruiser to enjoy with family and friends or as a live aboard, Bella Donna offer excellent value at a very reasonable price. 1975 Hatteras Sport Cruiser 1975 Hatteras Sport Cruiser, Thank you for viewing our awesome Hatteras that is now for sale. 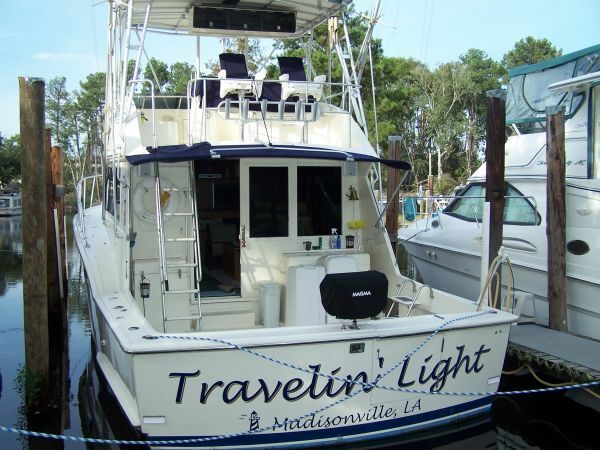 Below is a list of some of her amenities: She has an incredible kept interior with new custom aluminum mini blinds, new LED interior lighting, a full galley including fridge, stove top, microwave and sink. A dinette that also converts to a bed and a V-berth forward. The full head has a large vanity and new port-a potty. Settee and complete lower helm station. Two A/C units, and a dehumidifier to keep interior dry and mildew free. Carbon monoxide alarm and smoke alarm. Custom colored remote controlled LED lights, VHF radio, Stereo system and new speakers. GPS and Plenty of storage. The flybridge: has a full dash. New Standard VHF, New stereo & speakers, new Garmin Chartplotter, Depth sounder, Seating for 5 (3 new Tempress seats and a settee). New splash guard windshield, Cup Holders. Exterior features include: Custom canvas snap on front windows cover. Sunbrella bimini tops over flybridge and cockpit. Custom sunbrella Flybridge cover, Swim/Dive platform and ladder, Anchor, anchor chain, rode and windlass, SS rails, Bell, SS Grab Rails. SS Rod holders, Large cockpit is complete with custom molded in steps, it is big and roomy and great for entertaining and/or fishing, the cockpit also has built in storage bins and large easy access engine room hatches. Exterior completely repainted in Awlgrip paint in 2012! Boat is powered by two 454 c.i. Marine Power Vortec Engines (new in 2014) that boast 350 hp each with completely rebuilt transmissions and will get you there fast or cruise you there carefree. All upgrades were done professionally and boat is owned and maintained by a USCG licensed captain (unlimited). I have owned the boat for 5 yrs and am the 3rd owner. I have all records, blue prints and manuals for everything on board. Thanks again for looking. 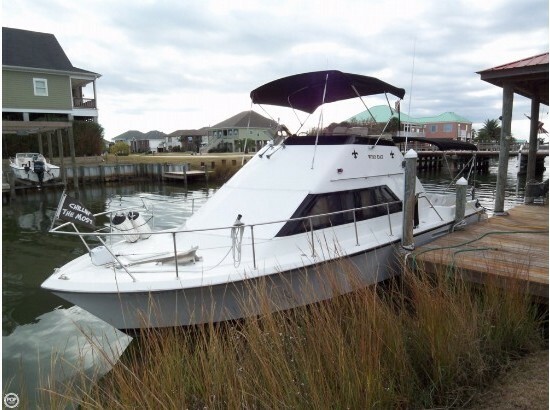 1985 Hatteras 55 Convertible 12V 71 TI Detroit Diesel Engines producing 1800hp. Complete engine overhaul with 300 hours since completion. She has the optional "galley up" floorplan and the optional 3rd Stateroom and 3 heads. This boat is priced to sell - owner is motivated. 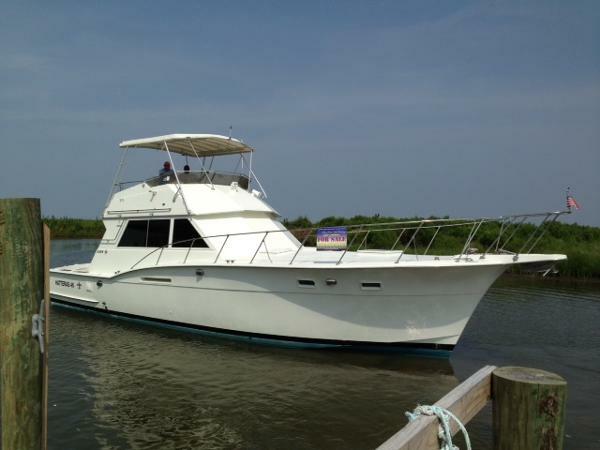 1978 Hatteras 6CTA8.3M The T. Will has been completely remodeled. She has new Cummins 6CTA8.3M 480hp engines with 2 year Warranty, new transmissions, new 13KW Kobada Genset, new shafts, cutlass bearings, new dripless stuffing boxes, new wiring, new batteries, new switches, painted bilge, new exterior paint, new salon sofa, new salon lighting, new underwater lights, new stereo system, new spreader lights, new vhf, new redesigned bridge ladder, new AC units and other new products. All the new owner needs to chose is floor covering and electronics. Boat cruises at 23 knots and tops out at 26 knots. New engines mean a great reduction in weigh and very economical cruise. This would make an economical sportfishing boat. 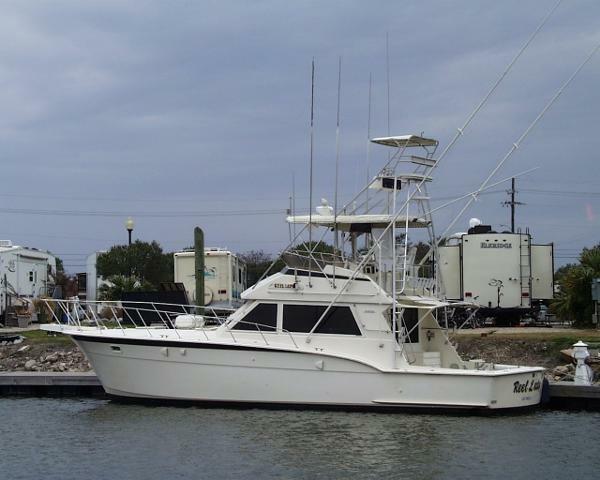 1968 Hatteras 50 Yacht Fisherman Bella Donna is a rare and much sort after Hatteras Sport Fish. The Sport Fish combines the luxury of a motor yacht and functionality of a sport fisherman into one comfortable and fuel efficient yacht. Powered by twin natural Detroit 871s she has the power to perform and ability to cruise very efficiently at 10 knots. Being 48’ long with a beam of 15’ 4” she has a spacious interior and covered side deck with plenty of forward deck space. Engines were overhauled by Detroit mechanics in 2003, she was rewired and re-plumbed during the same period. The engines have 729 SMO. Oil change, fuel filters, and impellers were serviced in September of 2016. Hauled out in May 2015 for inspection, bottom job and replacement of anodes. She has dripless shaft logs and an oil change system. The owner takes pride in this vessel and is shows. Service records available upon request. 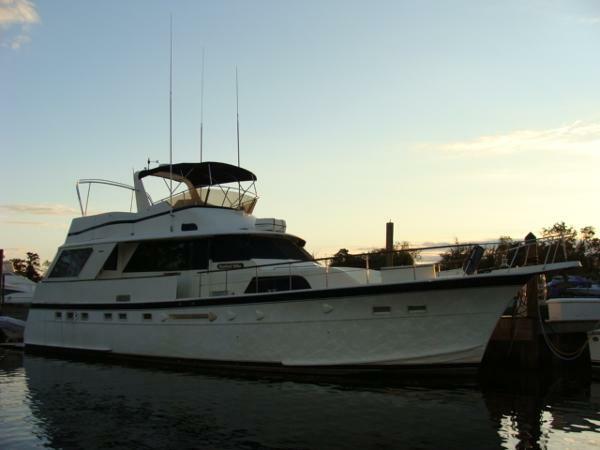 The current owner has enjoyed owing her since 2003 and wants to down size to better accommodate his current life style. For the buyer looking for an efficient and comfortable cruiser to enjoy with family and friends or as a live aboard, Bella Donna offer excellent value at a very reasonable price. 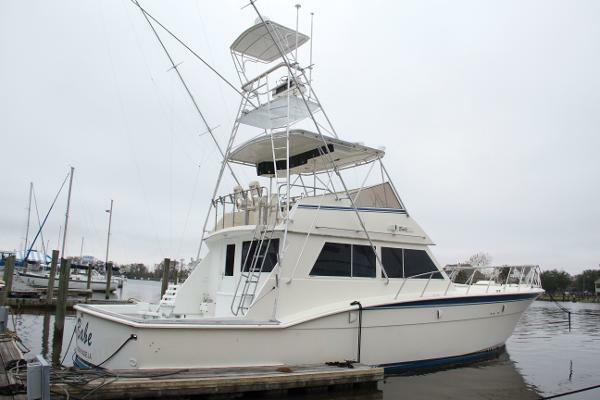 1984 Hatteras Sport Fisherman 45' Hatteras Sport Fisherman 1984Reel Lady The Reel Lady features the classic 45 layout with two staterooms and single full head, full galley down with a large salon, Marlin Tower, 6V92 Detroit Diesels. The décor is teak paneling though out. Owner say sell NOW!!! 1969 Hatteras Convertible NEW BOTTOM! See updated photos in photo section. 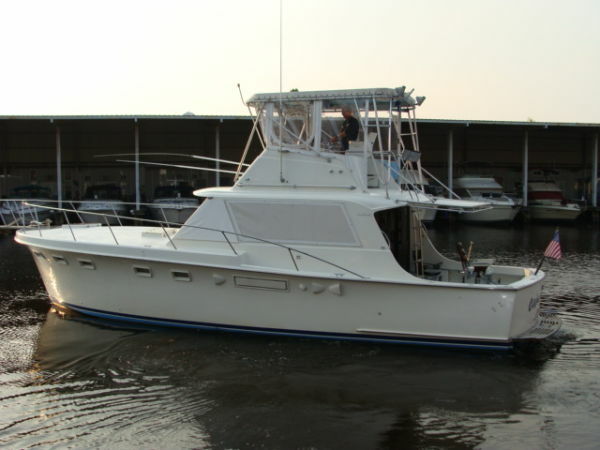 The Hatteras 34 Convertible is a great classic fish-boat as well as a family cruiser. She has a single-stateroom, galley down layout, with private head and shower and dual helm stations. The fully equipped galley has a 3-burner stove with oven, ample storage and a refrigerator making dinning on your weekend excursion easy. She has sleeping accommodations for four with a convertible salon couch and forward v-berth stateroom. Large windows naturally light the salon, with the convenient lower helm station for inclement weather. Roomy and comfortable salon has double aft cabin doors that lead to the cockpit for outside entertaining. Wide an open cockpit for the fisherman to generate new fish tales. If you are looking for an opportunity to own a true classic convertible cruiser, that has the comforts of home, "For Sale" is the boat you should be looking at. 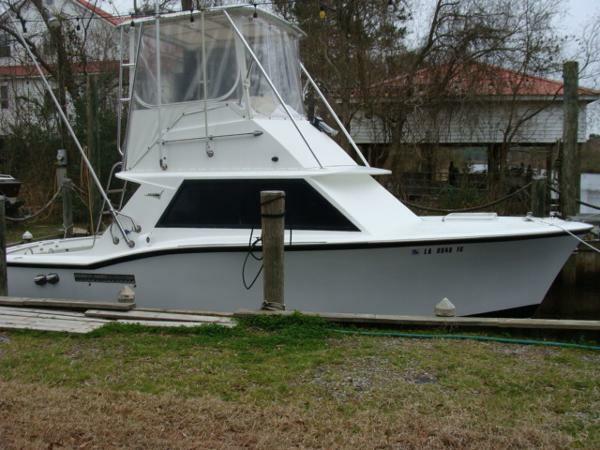 1970 Hatteras Convertible Cajun Cruiser is a perfect example of rock solid fishing machine. Legendary Hatteras quality coupled with exemplary care and updates makes this vessel stand out in a crowd of her peers. 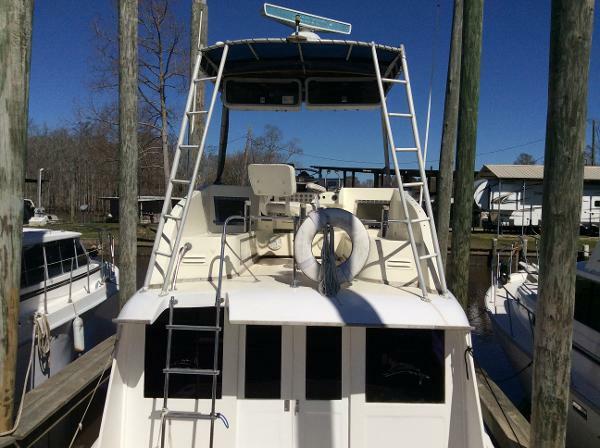 New bottom job, new anodes, new oil, new filters, new hoses, new interior, new hardware, new batteries, new electronics, new entertainment center, help to truly qualify the old statement "ready to go". Low engine hours (775) on trusty 3208 Caterpiller engines just begs to go fishing. Is it your turn to get a clean quality vessel that someone else spent loads of time and money to make just right? Give us a call. 1966 Hatteras Sport Fisherman The Hatteras has been restored completely, new paint job, wood floors, and all the creature comforts. 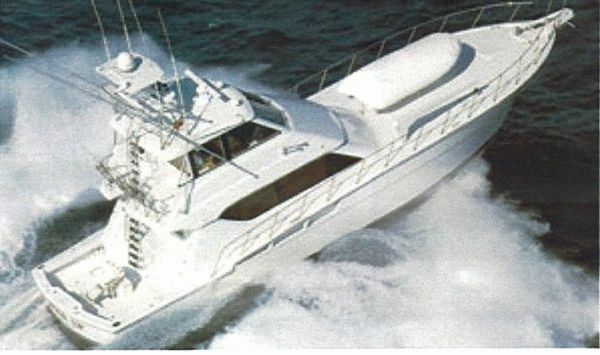 I have heard the expression many times "these hulls are bullet proof" having been a sixty's model Hatteras owner myself. The boat has been re-powered from gas to Mercruiser diesels, low hours and economical on fuel at 15gph at 22 knots. Her Lee outriggers & rod holders are ready to Fish! 1988 Hatteras Convertible The 45 Hatteras is an enlarged version of the popular two stateroom design of the 43 and used the extra feet to enlarge the cockpit improving the fishabilty- a great improvement over the 43. This boat received the modernization that Hatteras added in 1989 regarding the forward window treaments/enclosing and updated salon pocket door, making her look newer than she is. New canvas and Aft Awning combined with the other upgrades changes the look and feel of M/V Travelin Light adding to an already great value. She has the features and benefits of a newer vessel without the upgrade in price. This Hatteras Convertible offers duel lever engine control, 951 Northstar GPS with differential, Digital Tachometers, a NEW Raymarine C80 Radar and GPS Chart Plotter and for those who love to fish -- Outriggers for Deep Sea Trolling and much more. 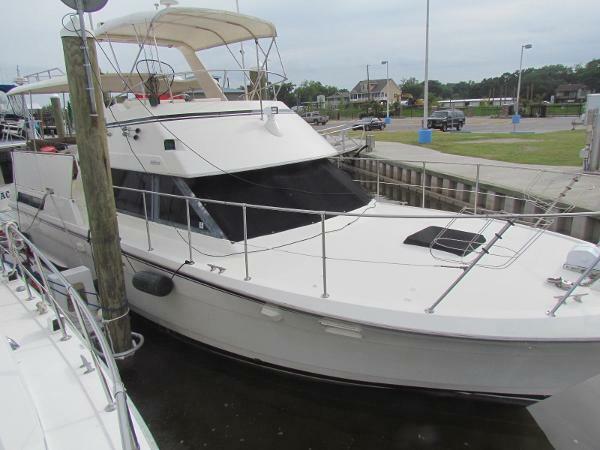 1983 Hatteras Classic Motor Yacht The still popular 53' Extended Deck-house model, "Nautical Miles", features the traditional Hatteras style and quality that you would expect, while taking maximum advantage of space. The full-width salon with extended entertainment area, three stateroom, three head, galley down layout meet the accommodations needed in an extensive cruising or live-aboard yacht. When it comes to entertaining guests, the galley with full size appliances and adequate counter & storage space and dinette opposite is great for informal meals. Trademark walk-in separate engine rooms, molded fiberglass table concealing aft deck A/C system, NEW canvas on upper helm & bridge deck, NEW Isinglass on aft deck and the hydraulic swim platform, doubling the size of the already large swim deck, are a few of the features that set this boat apart from the rest. Don't miss out on the opportunity to own this fresh water kept, clean vessel with good service records at such a competitive price! 1977 Hatteras Convertible The Hatteras 46 is one of the most popular convertibles ever produced. 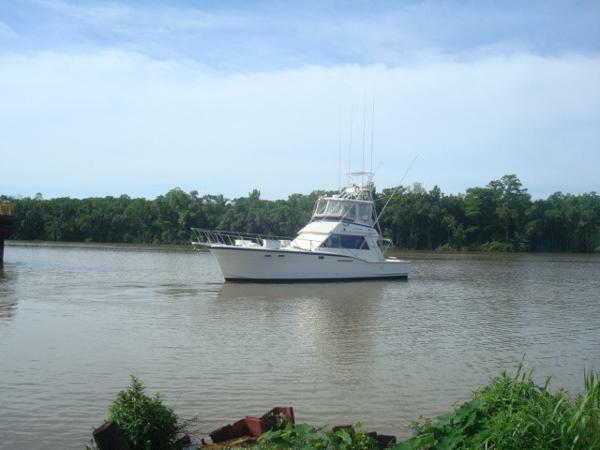 In addition to being an excellent fisherman with open-water handling characteristics, her comfortable interior accommodations with the alternate galley up layout with an additional sleeping area off the companion way (sleeps 6).